It was Thursday night. It had been a long, good week but I was tired. 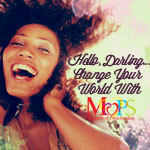 On top of our usual routine busyness, there had been a MOPS meeting to prepare for and a Sisterhood message to finish. I had just finished making dinner and I was craving some moments to myself. To my kids delight, I let them eat their dinner on trays in front of the TV. The sound of Miles from Tomorrowland and quiet kids gave me some peaceful moments to take a deep breath and strategize my next steps. I could only manage to think one step ahead and doing the dishes seemed like the next logical thing to do. I stood at the kitchen sink and sighed over the mountain of dishes. The dishes were not going to get done by staring and sighing so I began to scrub and circle the dishes clean. The warm, soapy water became a salve to my weariness. And as I scrubbed, I became overwhelmed. So overwhelmed, I began to weep. This was a different “overwhelmed” than I have become accustomed to. Not the overwhelmed by busyness or by my to-do list or by expectations, but overwhelmed with deep gratitude for my life and the people in it. Right there in my kitchen, in the quietness of my heart, memories came back to me so clearly I felt as if they were present time. One by one they came. I could smell things, feel things, and see details of things I had forgotten. I was with people who have long gone to be with Jesus. I was a little girl standing in the church kitchen, looking up into the faces of a circle of kind, older women. The women were smiling, chatting over their work of cleaning up the communion cups. They welcomed me in their space and allowed me to eat the leftover communion crackers. I felt accepted and safe. I was a little girl sitting in an oversized metal folding chair among a circle of other folding chairs placed around the small living room of my childhood home. Each chair was filled by a Godly man or woman. Some held hymnals and others large, beautifully tabbed Bibles in their laps. Their songs of praise beautiful. Their prayers powerful. I felt accepted and safe. I was a preteen kneeling on the rug in my parent’s friends living room, not quite happy that all my other friends were out at the movies and I was at a Bible study. Regardless of my inside-ungrateful-attitudes-struggles, I was still still in the circle and I listened to God’s word be discussed and life struggles shared. I felt accepted and safe. I was reminded of the countless times my parents had us hold hands around the kitchen table. This happened with whoever was joining us for dinner, when we needed the Lords’s guidance, or when we were praying for someone who needed prayer. I felt accepted and safe. Circles of people, circles of prayers. Accepted and safe. These were the people my parents chose to surround me with. Faithful, Jesus-loving, people who seeked God with all their heart. These were people who let me sit at their feet, invited me into their discussions, welcomed me to participate, let me ask my questions, and loved me through my attitudes and seasons of growing up. They were not perfect people. They struggled with life. They went through trials. Some of them lost their way. But these are the people who God used to shape my life. These are the people whose stories and testimonies shaped how I saw God and Jesus. These are the people who have prayed circles in and around my life. Prayers I am just starting to see answers to. These are the people who I wept to God in gratitude and thanksgiving over. Somehow, the dishes seemed to get done quicker than I thought. I lingered in the memories as long as I could. I didn’t want to leave. But the call of “Mommmm!!! !” brought me to my next task. I wiped the tears from my eyes and heading into the living room to fulfill some random request. The feeling of overwhelming gratitude remained. I want my children to have what I had. I want to leave a legacy like my parents have left for me. I want my children to grow up in circles of Godly men and women. To be able to sit at Jesus-loving people’s feet, invited into conversations about faith, feel safe enough to ask questions, sing songs of praises and embrace their part and purpose of the Kingdom of God. I want my children in circles of imperfect people who know they need Jesus, where powerful prayers are prayed, where life struggles are prayed through, where testimonies of God’s faithfulness are declared. Circle of people, circles of prayers. Where they feel accepted and safe. As I write this, I am overwhelmed and weep again. This time for the people currently in our life. Our faithful parents, grandparents, brothers and sisters. Our Godly friends. Our intergenerational church family whom I love so much. People who have graciously given us room to grow in our faith and have come alongside us, encouraging us in our parenting and leadership, and loving us unconditionally. People who have welcomed our kids at their tables, fed them, watched over them, given them smiles and a hugs, invited them into prayer circles and to join them in singing songs of praise. Imperfect, Godly men and women, who know they need Jesus, who pray circles around them and encourage them with their words. Circle of people, circles of prayers. Accepted and safe. This entry was posted in EMBRACE Community, EMBRACE Faith, EMBRACE Family and tagged church family, circle, community, family, generations, gratitude, intergenerational, legacy, parenting, prayer, praying circles, sisterhood, thankfulness. Bookmark the permalink. Shanna I would really like to do this challenge with you. I’d love to meet up and talk.